Rabbits & rodents during the winter months get hungry. One thing they will eat is unprotected bark on trees & shrubs in your landscape. Most susceptible trees are fruit trees & flowering crab trees. I have also seen damage to smaller Birch trees. The tree in the photo is a Corral Burst Crabtree with extensive rabbit damage. The tree may bud out this spring, but will eventually die. The outer bark that was eaten is where nutrients & moisture travel up & down the tree. The best thing to do to prevent this damage is use a white sleeve or fine metal screen. Put it on in the early fall & take off once spring arrives & the rabbits have other sources of food available. 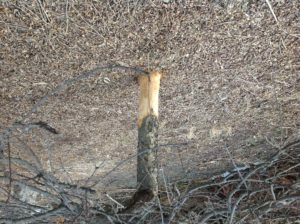 Also important in areas where deer are present, protect the bark up to where shade tree branches out. Most any type of shade tree can be damaged by a male deer rubbing its antlers on the bark of the tree. Another culprit to tree trunk damage is weed wips & lawn mowers. A good way to prevent this damage is to always keep a ring of mulch around the base of trees. This provides a safety zone for the tree trunk from mechanical damage. Mulch also helps retain moisture around the surrounding soil, has a insulating effect to help stabilize stabilize soil temperature and as the mulch decomposes give off nutrients beneficial to the tree. Jerry Knutson, owner of Arbor Hill Tree Farm in Cottage Grove, Minnesota. This entry was posted in Uncategorized on February 22, 2017 by admin.